The Root Cities: Who's Got the Money in La La Land? When Oprah Winfrey decided to throw her billionaire celebrity behind a presidential candidate for the very first time, it was no coincidence that she did it in Los Angeles. Nor was it surprising that while her home is in Chicago, the world's richest black woman decided to host the 2007 fundraiser for then-Democratic contender Barack Obama at her $50 million, 42-acre estate nestled between the ocean and mountains, about 90 minutes north of Los Angeles. For where else could the world's most famous media magnate assemble a guest list of 1,500 donors able to afford the $2,300 admission ticket — or raise enough from friends and relatives to pay the $25,000 entrée to a special VIP reception or the $50,000 for a seat at the VIP dinner? While the spectacular event was by no means a black affair, it was one of the greatest exhibitions of African-American wealth and power ever seen, raising some $3 million in one night. 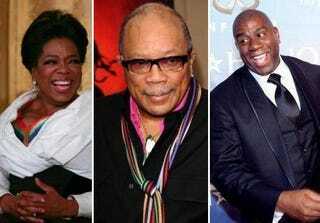 Los Angeles music legend Quincy Jones and former L.A. Lakers superstar Magic Johnson co-sponsored the gala, which attracted a who's who of black Hollywood icons, including Halle Berry, Whoopi Goldberg, Cicely Tyson, Sidney Poitier, Forest Whitaker, Chris Rock, Eddie Murphy, Morgan Freeman and Holly Robinson Peete. Stevie Wonder and BeBe Winans performed. As impressive as Oprah's party was for a city with a black population that has never been higher than 8 percent — even when the late Tom Bradley was mayor — African-American wealth and power in Los Angeles is not confined to well-known sports and entertainment figures. Through the years, the City of Angels has been home to some of the richest black businessmen and entrepreneurs in the country. Music-industry tycoons Berry Gordy Jr. and Clarence Avant both live in L.A. Paul Williams, the renowned African-American architect who designed Los Angeles International Airport and more than 2,000 other major buildings and homes throughout Los Angeles, including many in Hollywood and Beverly Hills, was a resident of Los Angeles. Today, real estate developers Danny J. Bakewell Sr. and Quintin Primo III are powerful and influential players in the shaping of L.A.'s physical landscape. (Primo is actually based primarily in Chicago but spends a good deal of time in Los Angeles, wheeling and dealing on the development scene.) The Bakewell Co., established in the late 1970s, is one of the largest and oldest privately owned African-American real estate and media companies in the U.S. And Bakewell is also owner and publisher of the Los Angeles Sentinel, the largest African-American newspaper west of the Mississippi River, and a radio station in New Orleans. He was recently elected president of the National Newspaper Publishers Association, which represents the nation's black newspapers. Primo, a 1979 Harvard M.B.A. who perennially makes the Forbes list of the richest African Americans in the U.S., founded Capri Capital with a childhood friend in 1992. The company now manages $4.3 billion in assets. Three years ago, Primo bought the Baldwin Hills Crenshaw Plaza shopping mall in south Los Angeles for $136 million. A year and half ago, he announced a $2 billion venture to build hotels, office towers and condos in Saudi Arabia, and says he plans to invest $1 billion in distressed properties and half-built construction projects around the country with financing from the U.S. Treasury. The public-radio and television talk-show host and activist Tavis Smiley lives in L.A. and has his company and foundation based there on Crenshaw Boulevard, in the heart of the black community. The couple, who have been together since they were students at Florida A&M University, have raised more than $22 million for HBCUs. "We decided to make that our [mission] — how do you utilize your wealth and ability to connect people and resources to different causes," says the former Xerox executive, who has lived in Los Angeles for 44 years. "There is money, and there are doers that make a difference. That's the part of the philanthropy piece I would like to see [wealthy African Americans] do more of. It's one thing to write a check and walk away. It's another to open your black book and connect people and create a network of people who believe in helping black folks help each other." Kinsey says that wealthy African Americans in Los Angeles are no worse or better than those in other cities around the country. It's just that because the city's black population is relatively small compared with other big cities with large or predominantly black populations, like Chicago, Detroit, Atlanta and Washington, D.C., L.A.'s ability to influence people's lives politically, economically and socially is "outsized." Former L.A. city councilman Mark Ridley-Thomas is the only African American on the powerful, five-member Los Angeles County Board of Supervisors, which controls a trillion-dollar economy — that means a black man runs 20 percent of that, says Kinsey. Still, with that and all the high-profile black wealth in L.A., Kinsey says, most black philanthropy is given through churches by average people. "We really do have a rich tradition of giving," he says. "But we give it to churches. The black community has always given in very responsible ways, and that's a story that gets overlooked." The Rev. Cecil "Chip" Murray, former pastor of L.A.'s famed First A.M.E Church and one of the most influential black clergymen in Los Angeles, says that as segments of the black community in L.A. and around the country become more affluent, they must take even more responsibility to reach back and help their less fortunate "brothers and sisters" afflicted by what he calls "the four poverties." He describes those as the poverty of the pocket, the poverty of family, the poverty of education and the poverty of imaging. "We do have athletes, performers and a few business persons in the upper ranks of income, but if you look at the larger picture, the poverty rate for African Americans is twice the rate for Americans in general," says Murray, who is now senior fellow at the USC Center for Religion and Civic Culture. A major reason for that, Murray says, is that even with an increasing number of wealthy black people, African Americans as a group are not accumulating and passing on wealth at the same rate as other Americans. "When you look at the poverty of the pocket, the dollar turns over one time in the black community [of Los Angeles] compared to five times in the white community, seven times in the Latino community, nine times in the Korean community and 12 to 18 times in the Jewish community," he says. "Our great challenge is consumerism. We spend as consumers rather than working as producers." Murray says the concentration of wealth and power among a relatively small number of celebrity athletes, entertainers and entrepreneurs is just not enough to fix the problems facing black America. "The great challenge is that we don't help ourselves," he says. "How can we expect anyone else to help us?" Murray says that while fewer Americans are willing to listen anymore, federal and local governments must still help overcome centuries of deprivation. But, he says, "Those who are reasonably privileged as blacks need to be aware of those who are underprivileged and combine their efforts to help them. We have some real true warriors in Los Angeles and Southern California who are really working to reach out to help the helpless. But if I had one wish, it would be that those in six figures or above would begin to do as other cultures do to a larger extent, and that is seeing the millionaires help the thousandaires, and the thousandaires reach out to the hundredaires." Indeed, Oprah's Obama fundraiser was an impressive display of black wealth and power in Los Angeles, but it doesn't begin to address the problems of African-American poverty in the City of Angels or any other. Sylvester Monroe is a regular contributor to The Root and a former Angeleno.